Anverso Lady Liberty profile wearing a Native American warrior’s headdress, with the word, ‘Liberty’ over the brow. Reverso A bald eagle perched atop a spear shaft dressed with foliage and the American motto the USA legend and the coin’s denominational value. Moneda de Oro MS-63 Águila India $10 de año aleatorio We’ll offer you the web’s lowest price when you purchase your Random Year $10 Indian Eagle MS-63 gold coin from our online store today! Struck by the United States Mint, the Indian Eagle is widely considered to be one of the most beautiful coins ever released. The reverse of this masterpiece features a magnificent and detailed bald eagle, perched atop a spear shaft dressed with foliage. Also on the reverse, the American motto, partly in Latin and partly in English, as well as the USA legend and the coin’s denominational value. The obverse design is a striking meeting of worlds, featuring the classic Lady Liberty profile, only this time she wears a Native American warrior’s headdress, adorned with the word, ‘Liberty’ over the brow. Also on the obverse, 13 stars above the featured effigy, the year of issue and a light, simple border. Both the obverse and reverse were designed by sculptor, Augustus Saint-Gaudens who, having succumbed to cancer shortly after completing the commission, never lived to see the coin’s release. 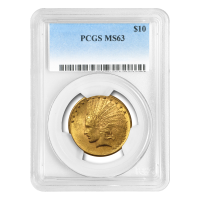 Own one of America’s most exquisite releases and diversify your holdings with a Random Year $10 Indian Eagle MS-63 gold coin today.